President Obama hosts British Prime Minister David Cameron in the Oval Office at the White House on Tuesday. Washington (CNN) -- U.S. President Barack Obama and British Prime Minister David Cameron on Tuesday blasted Scottish authorities' decision to release the convicted Lockerbie bomber last year and agreed on the need to push for a more transparent disclosure of the circumstances surrounding Abdelbaset Ali Mohmed al Megrahi's release. Cameron, however, said he is opposed to a British government investigation into the release. The two leaders also said they addressed a range of issues in talks at the White House, including the war in Afghanistan, sanctions against Iran, the state of the global economy and the responsibilities of BP -- a British company -- after the oil disaster in the Gulf of Mexico. "We can never say it enough. 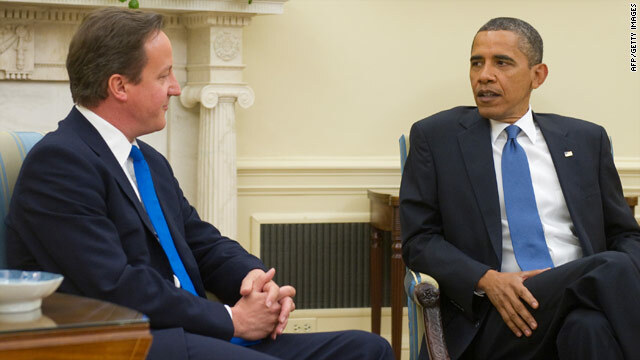 The United States and the United Kingdom enjoy a truly special relationship," Obama said. "We celebrate a common heritage. We cherish common values. ... (And) above all, our alliance thrives because it advances our common interests." The meeting was part of Cameron's first U.S. visit as Britain's leader. The two men met with reporters shortly after huddling behind closed doors. Video: Warmer ties between U.S., Britain? Cameron said the release of al Megrahi, who had been sentenced to life for his role in the bombing of Pan Am Flight 103 over Lockerbie, Scotland, was "wholly wrong." Al Megrahi, he said, was "the biggest mass murder in British history." The 1988 bombing killed 270 people. Cameron promised that the British government will cooperate with a congressional investigation into the controversy, though he stressed that the decision to release al Megrahi was made by the Scottish government without any involvement from BP. "There is absolutely no harm to be done in giving the fullest possible explanation" regarding the decision to release al Megrahi, Cameron said. "But I don't think there's any great mystery here. It was simply a "misguided decision" by Scottish authorities. The Scottish government freed al Megrahi last August on compassionate grounds after doctors said he had terminal prostate cancer and just three months to live. Al Megrahi is still alive nearly a year later, and news reports in recent days have questioned whether he was as sick as depicted. Questions also have been raised about whether a deal was cut to release him to protect British business interests in Libya, with oil giant BP exerting influence in the case. The Scottish government has insisted that BP never lobbied to free al Megrahi. Secretary of State Hillary Clinton and four U.S. senators from New York and New Jersey have called for Britain to revisit the case, even though there is little chance that al Megrahi will be returned to custody from his native Libya. Cameron was scheduled to meet with the senators during his visit to Washington. Obama said most Americans were "surprised, disappointed and angry" about the decision to let al Megrahi go. "We should have all the facts," he added. "They should be laid out there." The decision "ran contrary to how we should be treating terrorists." Turning to BP's responsibilities after the Gulf oil spill, Cameron said he "completely understands" the anger that exists "across America." "It is BP's role to cap the leak, to clean up the mess, and to pay appropriate compensation," he said. "I'm in regular touch with senior management at BP, and the president is, too, to make sure that happens." The two men said they were united in their goals for the Afghanistan war and in terms of preventing Tehran's acquisition of nuclear weapons. Cameron, however, remains under pressure at home to end the British involvement in the Afghan campaign. Britain is the second-largest contributor of troops to the military coalition fighting Taliban insurgents, behind only the United States. Obama also indicated they had both reaffirmed their commitment to fiscal responsibility in light of spiraling deficits in the major Western economies. At the same time, the president stressed that different countries are taking slightly different approaches, depending on their specific circumstances. Obama has pushed for the need for greater stimulus spending in the short term while addressing deficits as more of a long-term issue; Cameron entered office pledging the enactment of immediate austerity measures. In keeping with those measures, his office said earlier, the prime minister flew on a commercial flight to Washington. While their different approaches to the economic crisis underscore their different political orientations, Obama and Cameron, according to many observers, also have a great deal in common. Among other things, they're a similar age -- Cameron is 43 and Obama is 48 -- and they both campaigned on the slogan of hope and change. Cameron came to power in May in a historic change of government in the United Kingdom, about 18 months after Obama made history with his own election as the United States' first African-American president. The two men bet a bottle of beer on the outcome of the USA-England soccer match in the first round of the World Cup, and exchanged bottles in a lighthearted event when the teams tied 1-1 in June.